We headed down from the station towards the high streets, which quite frankly left me wanting more. High streets don't really float my boat anyway but these had little kerb appeal and almost everything was unexplainably shut. We required a Vodafone shop to top up our french sim card (Online top-ups are only possible with a french bank card) which we rely on for the weather forecasts. After an unenjoyable long walk to two different - and both shut - stores, I was getting hangry*, we had passed a few dubious characters and I was willing to give up on Marseille. Captain took charge, plonked me on a tram to the harbour, found a frozen yogurt cafe, sat me in the shade and delivered fro-yo with fresh strawberries. I came back from the darkness. It's hard to beat fro-yo but it got better. We walked up the north side of the harbour to Le Panier, an area of small crafts, vintage and locally owned boutiques. Now this is my kind of shopping. Eclectic stores run and owned by local people. 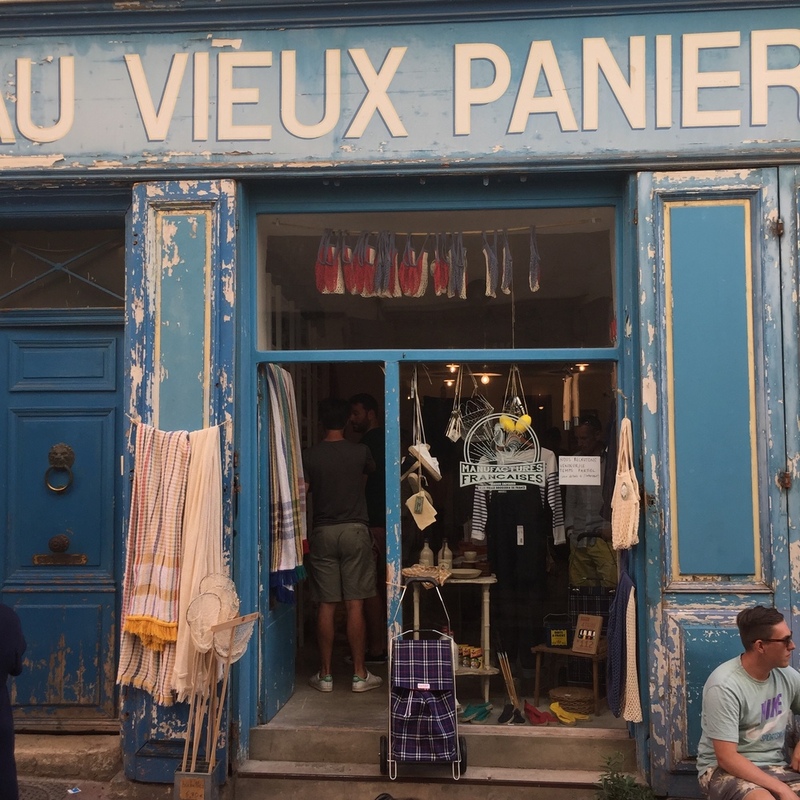 I found the single frenchiest french shop I have ever laid eyes on, Au Vieux Panier. Captain treated himself to a matchbox tin of Cachou Lajaunie These tiny liquorice candies with a touch of mint are a french classic and powerful breathe freshener. I quickly decided they are one of the only french delicacies that the french should keep to themselves! We visited a whole shop dedicated to the charming game of Pentanque before breaking outside for a drink. 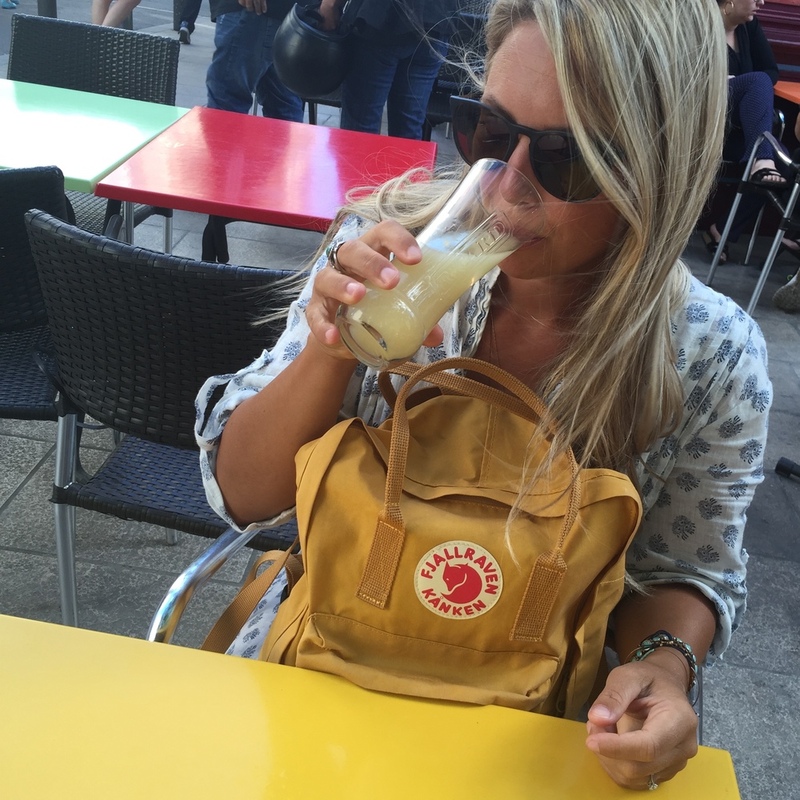 Although I should have known better after the Cachou Lajaunie experience, I let Captain order Ricard for us both seeing as it is the 'Milk of Marseille'. The clear Anise flavoured liquor goes milky when mixed with water, I love Anise but am sitting on the fence about Ricard. 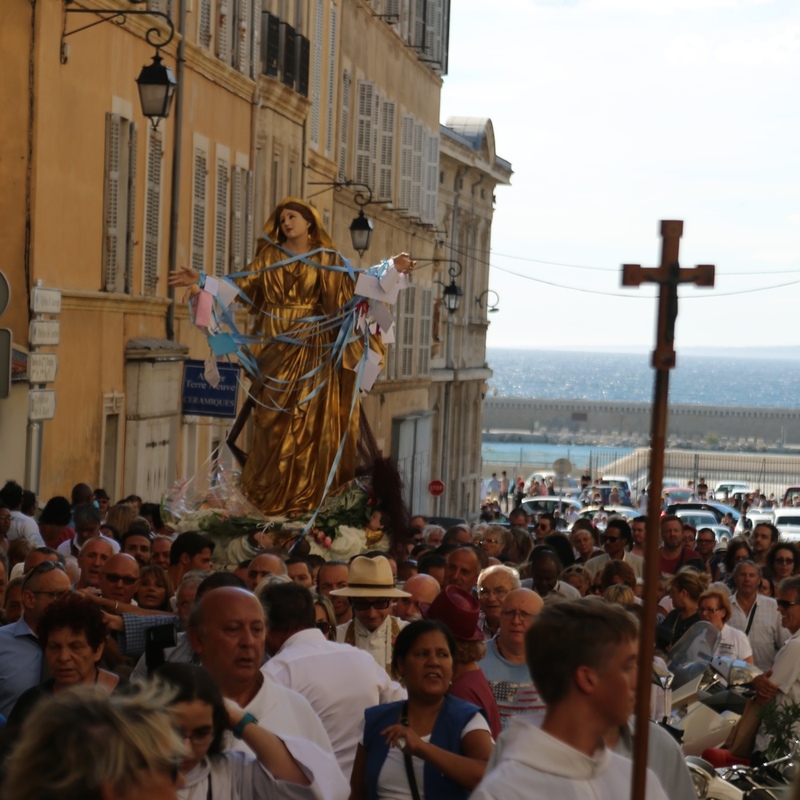 A few hundred Christians were parading through the streets of Le Panier escorting a statue of their fair maiden Mary, every year mid-august they carry Madonna high as a sign of devotion. We let the procession pass and headed they way they'd come, towards the Cathedral Le Major, a stunning church with beautiful detail, then strolled onto a more modern work of architecture MuCEM a landmark seafront venue which is filled with exhibitions on Mediterranean history & civilisations. Take the footbridge across to Fort Saint-Jean, built in the 17th century it was restored to open in conjunction with MuCEM in 2013. This historic monument looks like a small village, with the Tour du Roi René and the Tour du Fanal rising at either end, its chapel, its fountain, its café and its maze of courtyards, squares and streets. 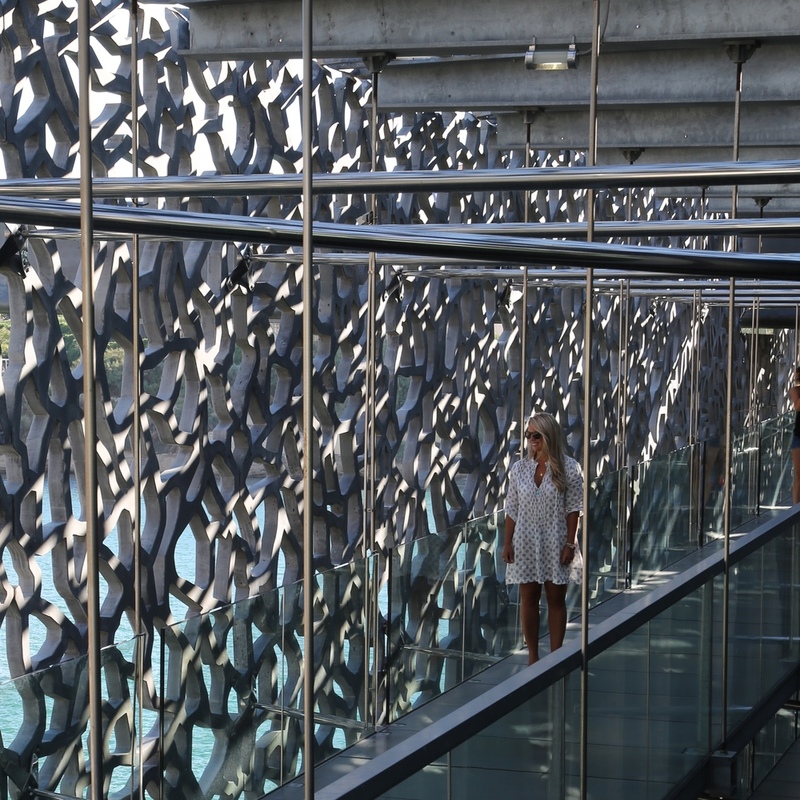 As you gently wander around, visitors pass through arcades, vaulted halls and raised gardens where you can enjoy panoramic viewpoints of Marseille and the Mediterranean. We stayed so long they had to ask us to leave. *Hangry. Hungry / Angry. A state of anger caused by hunger. It happens to the best of us. Especially me. Feed me.